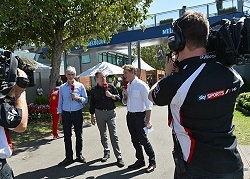 Tata Communications to distribute Formula 1 to Sky in UHD. London, September, 2016: Tata Communications - which is the Official Connectivity Provider of Formula 1® - Formula One Management and Sky have tested in action live Ultra High Definition (UHD) broadcasting at the 2016 Formula 1 Singapore Airlines Singapore Grand Prix. Following this first ever end-to-end broadcast of an F1® race in UHD, Sky will show all races of the 2017 season in UHD.